Chicho offers a third, perhaps more complex response to the weird holding conundrum. He says that the fad may have come from Europe, recalling that in the early 2000′s he saw in Paris a couple of guys he believes were the first ones to lower their right hands almost below the woman’s waist. A few years later the hand of the man holding the woman’s hand as if holding a “tray” become a style (if we can call it that way) very popular at the dreadful tango “Marathons”. So Chicho concludes that, the man’s hand holding a tray, plus the man’s hand almost touching below the waist of the woman, plus the woman’s hand touching the lungs, kidneys and love handles of the man are likely styles concocted in Europe and brought to Buenos Aires by the tango tourism boom of recent years. 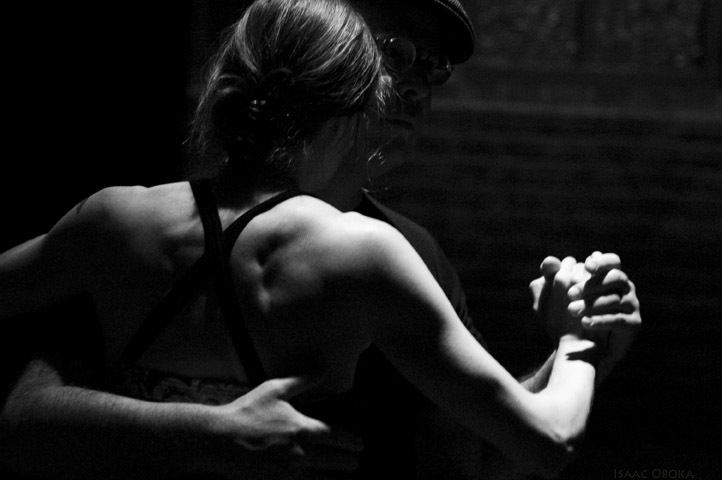 Whole new generations of tango dancers learn to dance tango without the benefit of understanding or even knowing the existence of the ever-important concept of La marca, the way the man sets the pace and indicates where and when the woman’s free foot created a new axis for her body.